This section is from the book "Progressive Lessons In The Art and Practice of Needlework", by Catherine F. Johnson. Also available from Amazon: Progressive Lessons In The Art And Practice Of Needlework. The second year sampler is made of coarse unbleached cotton for the following reasons:The threads are large and easily seen without straining the eyes. It is softer than bleached cloth of the same quality and more easily handled in preparing seams. It is not so quickly soiled. The pupil in learning to thread the needle for work on cotton cloth must use a coarse needle and thread, which should be used only on coarse cloth. Fine cloth requires a fine needle and thread. Colored sewing cottons are used, because a child can more readily see her stitches and their shape, size, and method of joining. The teacher of this class should interest her pupils, and awaken a desire to know all about steel, from which needles, scissors, and emery are made. Also have talks on the nature and growth of cotton, or tree wool, and its various uses. * Show cotton seed and tell the processes of growth until the raw cotton appears. 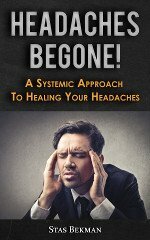 Tell how the cotton is gathered and made into threads; how the threads are woven to make cloth. * " Every Day Occupations," by H. Warren Clifford, S.D., will be found useful as a reference, when studying about these raw materials. Cloth has two kinds of threads; these are called length and width threads, or warp and woof. The length threads are always stronger than the width threads, because they must be stretched on the loom while the width threads are woven into them. When a piece of cloth is woven or finished, the length is readily known by the selvedge, or finished edge. The width is between the selvedges. The bias is the diagonal fold formed by placing the selvedge and width edge evenly together. Take one yard of the coarsest Penelope canvas (Figs. 4 and 5); hold this in sight of the class, and have the pupils tell the length and width threads, and how the bias is formed. Fig. 4. - Canvas showing finished edges. 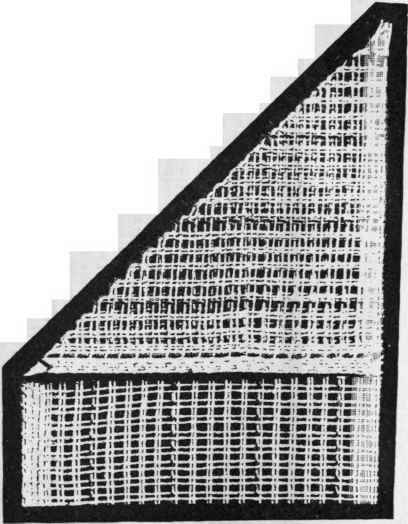 The pupil should make a drawing on the blackboard of a piece of cloth, showing the selvedge, cut edge, and bias; she should also express in writing the idea formed in her mind by these terms. A clear perception of all this, when once gained, will be a help in every lesson. Measuring and cutting: The class should be provided with rulers, from which to learn the inch and its divisions. Have each child cut from stiff and unruled paper a piece exactly 6 in. long and I in. wide, to use for measuring; have the edges even and the corners square. This measure is kept in the work bag. Mark, as on a ruler, the whole, half, quarter, and eighth inches. The pupil must remember these lengths, as they are often spoken of in her work and in places which cannot be easily measured. Let the pupils space the different measures on paper and on the blackboard by means of dots and lines, using the ruler as a test of exactness only. Give the child a piece of paper 3 in. x 9 in. Let her fold the lower left-hand corner over to the upper edge, and crease the diagonal or bias line thus formed. Then crease the line parallel with the outer edge, to mark a piece 3 in. square. Measuring with this square, fold and crease the whole nine inches of length into squares. Cut the squares apart, and lay aside for patching in paper (Fig. 6). Fig. 5. - Canvas showing width and bias, or diagonal fold. Fig. 6. - Measuring and paper folding. To represent patching on paper: Give to each pupil a piece of thin manilla paper large enough to cut from it a strip 4 in. 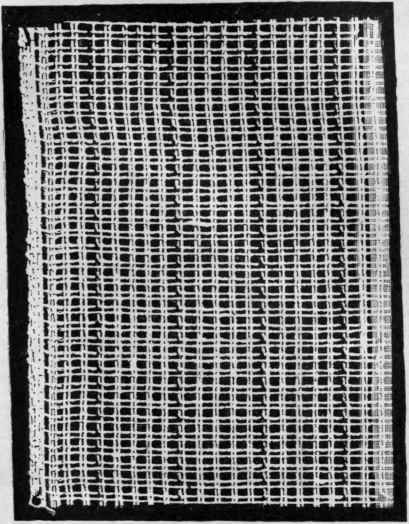 x 8 in., to represent the size of the paper or cloth to which the patch is applied. Fold this strip into two 4 in. squares; fold again and again, making 2 in. squares. Now there are eight 2 in. squares. In the centre of one of the 4 in. squares cut an irregular hole to represent a worn place (Fig. 7). Cut another strip of paper 3 in. x 9 in. Fold and cut this into 3 in. squares for patches. Crease these patches into four equal parts (Fig. 8). 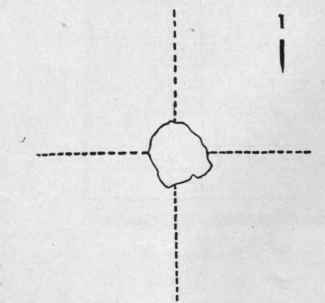 Mark with a pencil on paper, or with a pin on cloth, the length or selvedge way of material and of patch. Turn a fold of 1/8 in. on the patch, then place the centre of the patch directly over the centre of the worn place, making the creases on material and patch match perfectly, continuing the preparation for sewing as described in answer to question 45. On the second 4 in. square make a stitched-in patch as described in answer to question 49. When this has been done satisfactorily in plain paper, give the class paper marked with even and uneven stripes. A striped paper of German manufacture has been found very good for this purpose. Several kinds of patches can be first taught upon paper. fig. 7. - Paper folded on dotted lines for patching. After patching on paper has been taught, the blackboard can be profitably used. Younger pupils are interested in watching the teacher as she makes drawings to represent a tier or an apron having a worn place, and a patch to mend it. 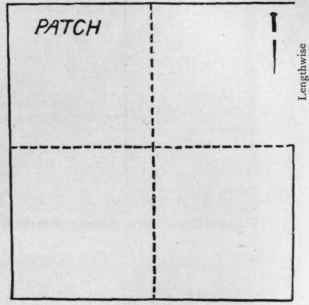 Dotted lines across the worn place and the patch show folds which are to be applied to one another. Now, giving a ruler and pencil to every pupil, let her draw and cut from striped paper a 3 in. patch; turn down 1/8 in. on the four sides. Then give to each pupil a small pattern of a tier cut in striped paper, with a worn place cut upon it. Baste the patch on the right side of the tier, making the striped lines on the tier and the striped lines on the patch match perfectly, the centre of the patch being exactly over the centre of the worn place. Baste 1/8 in. from the edges of the patch.